‘Return to the Med’ show garden at the Malvern Spring Show, a summary of this month’s activities…….. The disappointing weather we are currently experiencing has delayed the arrival of the plants at the nursery, and is causing some worry as to whether or not they will be at their best in time for the show. The two trees (Elaeagnus angustifolia) did arrive from Italy, but don’t quite have the impact we are looking for, so that has prompted another search, ringing around a dozen or so nurseries. Work has started on the pre-cast mosaic panels. This will form part of the paving, edging and coping, and is an important element of the garden design. Individual panels will be made up in wooden troughs, which will then be assembled together on site during the build. 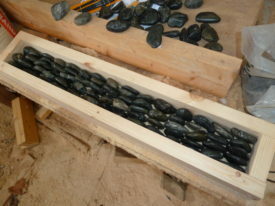 Black and white pebbles are being used which are in keeping with the Mediterranean theme. 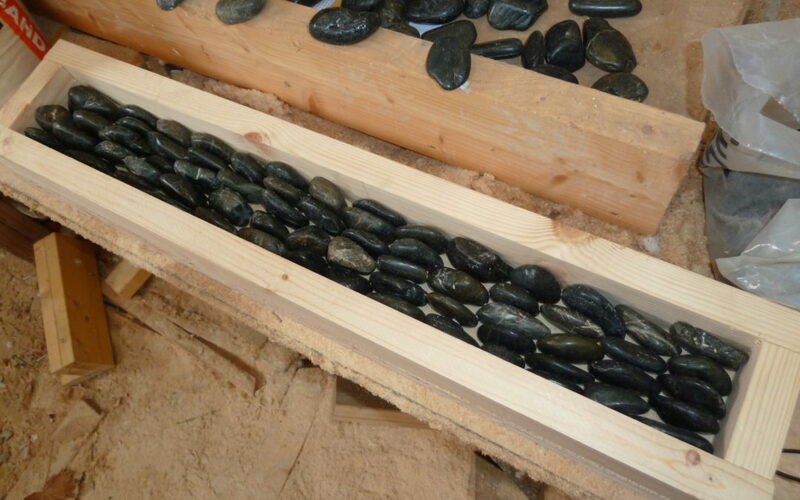 There are quite a few panels to be made, and the process itself is very time consuming, involving sorting through 3 tons of pebbles (to select appropriate sized pebbles), laying the pebbles in the troughs (upside down), adding sand to a specific level before adding the grout. The grout is allowed to dry, but not completely before pouring a concrete mix over it. There is a final drying step before the panel is turned the right way up and removed from the trough. This will be the first time that the design will be seen the right way up, so no room for error! Joe Watson and his team at Cotswold Estates & Gardens will continue working on the panels over the next week or so, probably right up to April 15th, and the start of the garden build at the Three Counties showground. 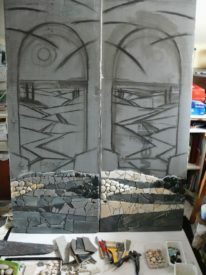 I also got to see the first glimpse of the mosaic design for the feature wall, which is being created by Robin James (mosaic artist based in Stroud). Robin is making good progress, and the design looks fantastic, when it is completed it will be a picture of a Mediterranean landscape. With just a few weeks remaining until the actual build starts there are still a number of activities to complete, and an anxious watch on what the weather is doing, we need a warm spell real soon!